Like El Greco and Vincent van Gogh, his illustrious predecessors in the genre, Picasso seems to have had a predilection for the self-portrait, where the external image of the man becomes infused with the subjective projection of the artist; throughout his long career he painted various likenesses of himself that reveal his progress in life and art. 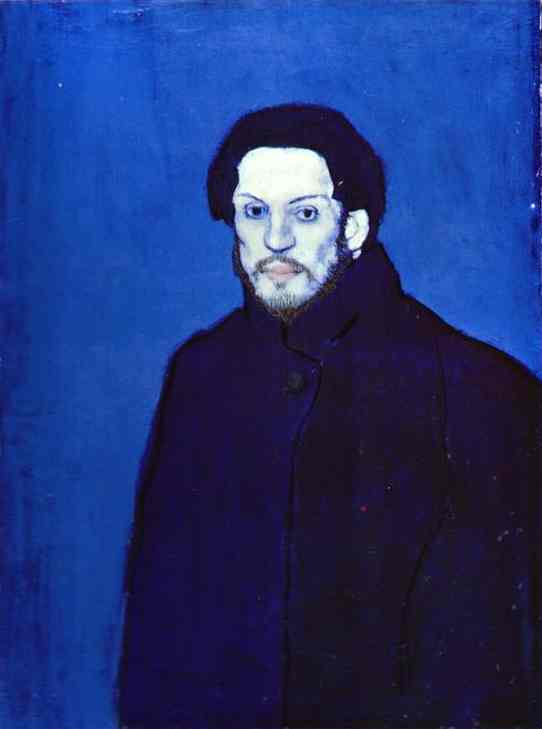 This Self-Portrait, painted during his second stay in Paris in the winter of 1901, was the end of a series and marked the beginning of the Blue Period. He returned to Barcelona in January 1902. Picasso was only twenty years old at the time, but he appears considerably older in this portrait. His face is drawn and gaunt from the hardships of the Parisian winter. The livid pallor of the face, relieved only by the orange tint of the lips, the scraggy beard, and the high-collared greatcoat that enshrouds the body, all heighten the feeling of sadness and solitude that emanates from the canvas. The use of cool tones, especially the deep purple of the coat, and the light, almost "anaemic" brushwork overall - except in the face - are completely in keeping with the stark, ascetic image. The fluid contour of the greatcoat, which is treated in broad, vertical areas separated by a black line, recalls the influence of Gauguin. The psychological intensity expressed in the artist's sombre and almost hallucinatory gaze is reminiscent of self-portraits by Vincent van Gogh. The work owes a considerable debt to the late self-portrait of Vincent van Gogh, particularly his Self-Portrait with Bandaged Ear. The shape of the coat and the layout of the composition were later repeated almost identically in the Celestina portrait.. In this uncompromising vision of himself, Picasso makes no secret of the trials and tribulations that beset the young artist, but he does not fall prey to sentimentality. The Spaniard still has his pride.